About 6 years ago, on another blog, I did a post about a rising young evolutionary biologist who wrote a book based on accepted evolutionary science, but which related the science to the Bible’s account of creation in Genesis. He was soundly lambasted for his temerity. Now a young astrophysicist has dared to do a similar thing – accept established cosmology but relate it to Genesis 1. Andrew Parker was, and still is, an eminent evolutionary biologist. His specialities are the evolution of the eye and biomimetics. He gained attention for proposing the the development of the eye was the cause of the Cambrian Explosion, a sudden increase in species about 500 million years ago. Now his main work in biomimetics uses design in nature to develop new technologies that are more efficient than the current ones, in such diverse areas as hologram-based security devices on credit cards, improved solar panel efficiency and improved water efficiency. His 2010 book, The Genesis Enigma stepped through the six days of creation in Genesis and compared these to standard evolutionary theory. Unlike most scientists and theologians, who don’t think Genesis has any scientific credibility, and most creationists who don’t think the theory of evolution has any credibility, Parker tried to show that evolutionary science fitted into the six days rather well, provided we take a fairly flexible view of Genesis. There is no doubt that some of the Genesis days fit evolution quite well, but a couple are a bit more of a struggle. The biggest difficulty is explaining how there was light on the first day, vegetation on the third day, but the sun was only created on the fourth day. Andrew’s innovative idea is fitting – he says the fourth day corresponds to the evolution of the eye, the first that any living thing “saw” light – but it isn’t entirely convincing. Andrew was an atheist before he wrote this book, but he said his conclusion, that Genesis was way more accurate than we could expect from such an old document, led him to wonder if it was “proof” of God. However more recent PR material from him doesn’t mention this book, so perhaps he has changed his mind, or perhaps he felt, or was told, that linking science with Genesis wasn’t a good career move. Sarah Salviander is a research scientist in astronomy and astrophysics at the University of Texas. Her parents were agnostic/atheist, she knew very few christians growing up, and by the time she went to university she was hostile to christianity. However working on the science of the big bang led her to the same observation as Einstein, that “the most incomprehensible thing about the world is that it’s comprehensible”. She saw an underlying order in the universe that led her one day to joyfully realising she believed in God. From there she read The Science of God by Gerald Schroeder, which convinced her of the truth of Genesis, which led her to accept that the gospels and the story of Jesus were also true. And so she converted to christianity. Sarah is one of the main contributors at the Six Day Science website and blog. In one of the site’s main pages, Six Days, she presents her explanation of how the Genesis account of creation fits with modern science (based on Schroeder’s book), via a 125-slide presentation. Like Andrew Parker, she argues that current cosmological and evolutionary science are correct, and that Genesis, understood correctly, gives a scientifically accurate description of how it happened. Sarah’s big idea (following Schroeder) is to explain why the Bible said creation took 6 days, whereas science shows that from the big bang until the appearance of humans was almost 14 billion years. She discusses that Einstein showed that time isn’t constant, but relative. When something speeds up close to the speed of light, its time slows down. So, she explains (and I must admit I struggled with this explanation), as the universe expanded after the big bang, time slowed down. 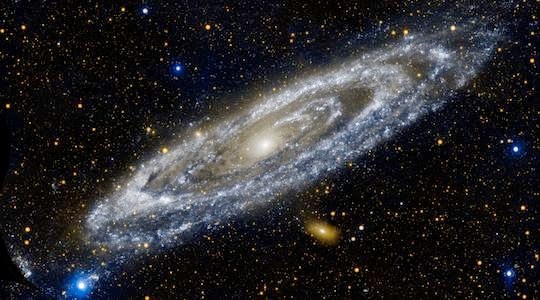 As a result, what was 1 day from God’s viewpoint outside the universe was in fact millions or billions of years from the viewpoint of the earth, which is caught up in that rapid expansion. She does calculations, as only an astrophysicist can, to show that when we make the calculation for each of the six Genesis days, they map quite well against the timeline developed by science. Finally, she argues that the Hebrew wording suggests that Adam wasn’t created out of nothing, but by placing a living “soul” inside an existing hominid. It is important to note that Andrew and Sarah’s approaches are nothing like creationism. Both accept current science but their ideas cut across both creationism and materialistic science. So are their ideas reasonable? Genesis – myth or fact? Many christians believe Genesis 1 is scientific and historical fact, but most scholars these days would regard it as myth, a view also held by CS Lewis. If it is myth, then conforming to science becomes less important. Most creation myths of the time are lurid, fantastic and unbelievable, often involving fighting among the many gods. For example, in the Akkadian Enuma Elish, the earth is created from half the corpse of the god who lost the battle. Compared to most of these, Genesis is sober and sensible. The Genesis story says the universe had a definite beginning (something science now accepts, but didn’t for many years). Genesis says all humans came from Adam and Eve. Curiously, genetic science now says the same thing, with the one crucial difference, that our single male progenitor lived thousands of years before our single female progenitor. There were other humans around at these times, but none of their descendants survive to the present day. The order of creation has some similarities to the scientific account, but with some differences too. The trouble with Andrew and Sarah’s accounts is that they seem somewhat contrived. Some of the explanations seem forced, and others are extremely doubtful. If you really feel the need to accept both Genesis and science as true, then these harmonisations will likely be important to you. But since I accept that portions of the early Old Testament are mythical, I don’t feel the need for these harmonisations, and I can’t help feeling they are not sufficiently credible. Scientists in a bad light? Nevertheless, the reception given to these ideas (especially Andrew’s book) doesn’t show modern science in a good light (to me). Both Andrew and Sarah accept modern science, so scientists needn’t feel threatened by their ideas. But it seems that many non-christian scientists see any attempt at reconciling science and the Bible as compromise, and attack it vitriolically. From a scientific viewpoint, I think the reactions were unnecessary. What readers can expect from this blog. Can the universe be explained except that God made it? An atheist vs a scientist. « Do mystics really experience God?